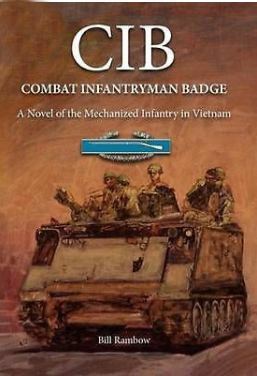 CIB: Combat Infantry Badge, book one of the Philip Lawson saga, introduces us to Specialist Fourth Class Philip Lawson, an Army infantry soldier initially assigned to be a helicopter door gunner in Vietnam. As often happens in the military, his assignment is changed and he winds up instead in a mechanized infantry company, an assignment initially not to his liking. After the shock of knowing he is not going to be in a helicopter, he sets out to prove himself to his fellow soldiers. Philip has a domineering brother named Captain Paul Lawson, who shows up in the combat zone. It’s Paul’s influence that he has tried to avoid. Now, without anything to say about it, Paul is back in his life and Philip must deal with it. The interaction between the characters is plausible. So is the banter, sometimes hilarious, that makes the characters come alive. Like many of those who did a tour of duty in Vietnam, the soldiers find ways to take up their time while waiting for the next life-threatening battle. Odd pets wind up in the story. Rambow shows this interconnection between the men well. The unbreakable bond between soldiers who depend on each other for their lives stands out in this novel. Bill Rambow has written a very good book that is a page turner. Specialist Fourth Class Philip Lawson arrives in Vietnam after re-enlisting with the promise of assignment as a helicopter door-gunner. But when he arrives in country he is assigned as a replacement to a mechanized infantry ­company and his dreams of action in the sky over Vietnam evaporate in a haze of red dust and sweltering humidity. arrival in the combat zone of Captain Paul Lawson, the domineering older brother whose influence he has been trying to escape for years. During his R&R in Sydney, though worried that the war may have forever hardened and brutalized him, Phil finds love and the promise of a bright new future-if he can survive his tour of duty. Ultimately he must fight alongside the hardened soldiers who will become his brothers, against an unseen and ruthless enemy to earn the coveted Combat Infantryman Badge.